ISABELLE: I would like you to discuss social censoring online and, possibly, processes of healing in a group that is a free platform of creative expression. LIZ: thru thisProject, iveLearned that AsAModerator wen censoring ExplicitContent online AsDetermined by the InconsistentStandards of YtMansLaw, it isnt necessarily advantageous 2 KeepVisible EvidenceofTrauma that re-traumatizes individuals n perpetuates SystemsofOppression&Violence thru its normalization. It’s Useful2GiveRoom2 theseNarratives wen there is grounds/resources 4 processing/healing thru it, like in the technique of ExposureTherapy, but this RequirestheConsent of the individuals who will be Subject2theExperience. AsAUser, U ShouldFeel ofRightJudgement 2 Determine WutUPost, Employing TriggerWarnings where needed IS CommunityCare. ISABELLE: Hari’s tweet caused an uproar for a few reasons. Her visibility is bittersweet. Some saw it as if through her image high fashion mags were using transness as click-bait or framing it as a trend. Of course, visibility brings with it normalization, but at the same time, safety/care/attention/$$$ is still not given to those whose voices can’t or don’t want to be as loud as hers. 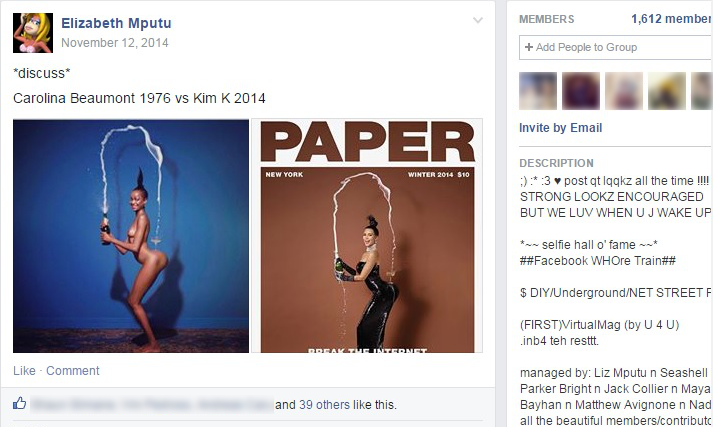 Her image is monetary, and she was commenting on a group whose content relies on DIY fashion photos and selfies. So when she tweeted, “like who added me to that inb4 group on facebook,” group participants assumed that she was saying she was “too good” for “plebeians” like us. A post was made triggering over a hundred comments of petty insults (including misgendering) and very thoughtful defenses of Hari. Her viral popularity mirages as acceptance, so her comment pulled out the insecurities of some who are pretty regularly and violently cast out. LIZ: Allowing manipulative abusers in2 inb4 compromised the group’s safety, wuts ur advice 4 asserting boundaries/ avoiding SaviorComplex as an EmpatheticAdmin? MAYA: As an inb4 admin I handle conflicts by first recognizing that someone’s behavior is truly incompatible with the shared values of the group. This can be tricky because there are many sub-ingroups within the larger inb4 microculture. I try to be as objective as possible when responding to drama in the group, i.e. I don’t go blocking just anyone I personally have beef with. Apathy is a big problem with conflict resolution; the mere presence of other people causes individuals to diffuse responsibility in favor of “letting someone else handle it.” My advice is to get in there and be the authority figure, don’t be indifferent. Understand that when conflicts intensify judgments and stereotypes become more rigid & people get a twisted boost to their sense of self by disparaging others, creating a cycle that can only be broken by removing the loudest negative voice. The trick is maintaining harmony between hundreds of different personalities. Avoiding groupthink is critical! Varied perspectives enable rich dialogue, but conflict does not beget social advancement. 1 Parker Bright was unable to participate in this interview. Black bodies both on and offline exist in defiance and at war with time and I respect my dear friends decision to opt out. Parker Bright, Hamishi Farah, Hannah Black, and Aria Dean are among many in the black art community who have used their names, voices, and platforms to resist against the continued acts of white supremacist violence perpetuated in the art world by its investors, curators, institutions, and all those who benefit from othering black bodies as objects crafted for white consumption n speculation— in this case in protest of the Emitt Till portrait by white nationalist D*** S**** at the Whitney Biennial, 2017.